With their classic team colors of silver and black, the Oakland Raiders are one of the NFL’s storied franchises, winning 12 division titles and three Super Bowls, yet the team plays in the last multipurpose stadium in the NFL. The history of the Raiders began in January 1960 when the City of Oakland was awarded an expansion franchise by the AFL. At that time, Oakland was viewed as being a bedroom city and not a metropolitan city. In the 1950s and early 1960s, city officials developed plans to construct a major league stadium in order to change the way the city was viewed. A big league stadium would change the city’s image and help Oakland lure a professional sports franchise to the area. Led by Robert Nahas, a nonprofit corporation was formed to finance and construct the new stadium. Several sites around Oakland were proposed, but the group chose a site near the Elmhurst District of East Oakland, as the site for a stadium. In 1962 the stadium was approved by Alameda County and the City of Oakland leading to construction the following Spring. While the stadium was constructed the Raiders played at stadiums around the Bay Area including Kezar Stadium, Candlestick Park and Frank Youell Field. NFL MVP and Offensive Player of the Year Kenny Stabler in 1974. QB Rich Gannon passes for 4,689 yards and throws 26 touchdown passes in 2002. Originally named the Oakland Alameda County Coliseum, the stadium was constructed deep in the ground, allowing fans to enter the stadium on the upper level and walk down to the field level seats. Completed in four years the Raiders played their first game at the 45,0000 seat coliseum on September 18, 1966. Designed to be multipurpose, the Raiders were the sole tenant of the coliseum for two years. Following the 1967 baseball season, the Kansas City A’s moved to Oakland joining the Raiders as tenants of the coliseum. The Oakland Coliseum was built more for baseball than football. Many of the 45,000 seats were in three tiers from the right field foul pole and circling around to the left field foul pole. Bleachers were beyond the outfield wall. The Oakland Coliseum was converted two ways from baseball to football after the A’s moved into the stadium. The MLB season overlapped the first couple of weeks of the NFL season. During this time, the NFL gridiron was located between home plate and centerfield, making the conversion process simpler. Once the baseball season was over, the gridiron was located along the first and third base areas, with bleachers placed in the outfield. 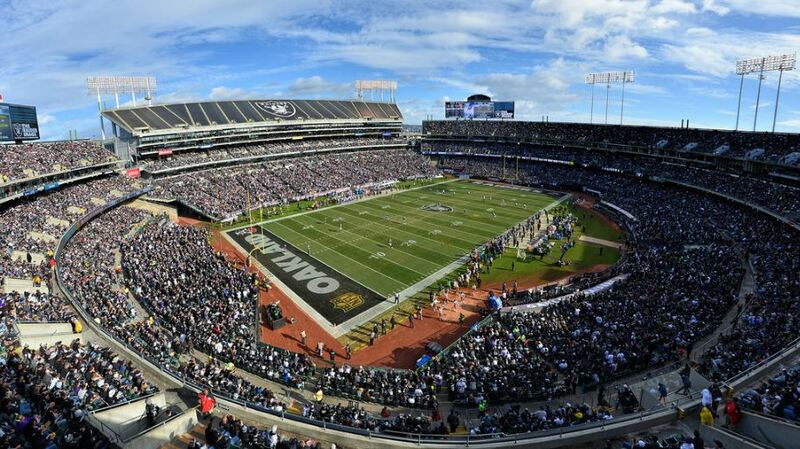 For 15 seasons the Raiders played at the Oakland Coliseum. In the late 1970s Raiders owner Al Davis wanted the city to renovate the coliseum to add more luxury seats to generate additional revenue. The city balked at this plan and Davis moved the team south to the Los Angeles Coliseum after the 1981 season. Davis incurred the same issues in Los Angeles as he did in Oakland. The Los Angeles Coliseum lacked additional luxury seats, was in a bad neighborhood and the Raiders had to share the coliseum with the USC Trojans (NCAA). Davis wanted a new stadium built in Los Angeles but failed. In the late 1980s the Raiders began to negotiate with Oakland to move the team back if the Oakland Coliseum was expanded. It took over five years for the Raiders and the City of Oakland to reach an agreement to have the team return to the coliseum. A deal was struck in June 1995 and in November 1995, construction began on a $200 million project to expand the coliseum, adding 22,000 seats. All of the outfield bleachers were removed and replaced with a four tier grandstand that includes 125 luxury suites. After a 15 year hiatus, the Raiders returned to Oakland for the 1996 season. The coliseum has had many names throughout its history, the Oakland Coliseum, Oakland-Alameda County Coliseum, Network Associates Coliseum, McAfee Coliseum, Overstock Coliseum and O.co Coliseum, but is now known as the Oakland Coliseum. In 2013, due to a decrease in attendance the Raiders placed tarps over all seats in the upper deck on the east side. This reduces the seating capacity to 53,250. New for the 2015 season were two new 36 feet high by 145 feet wide HD video/scoreboards. Costing $10 million they replace the existing dot-matrix scoreboards. For years the Raiders sought to have a new stadium built as they are the only team in the NFL who still shares a stadium with a baseball team. Not only this, but the coliseum is the second oldest stadium in the NFL and lacks many modern amenities found in newer stadiums. The Raiders spent numerous years trying to work with local officials in Oakland to develop a stadium plan to keep the team in the city. They also explored other options including relocating to cities such as San Antonio, Los Angeles and Las Vegas. In 2016 plans emerged from developers in Las Vegas to build a stadium to attract a NFL franchise. In Spring 2016 Raiders owner Mark Davis visited the city and indicated he was interested in moving the team here and in March 2017 the NFL approved the relocation of the Raiders to Las Vegas. A new stadium in Las Vegas is not likely to open until 2020. 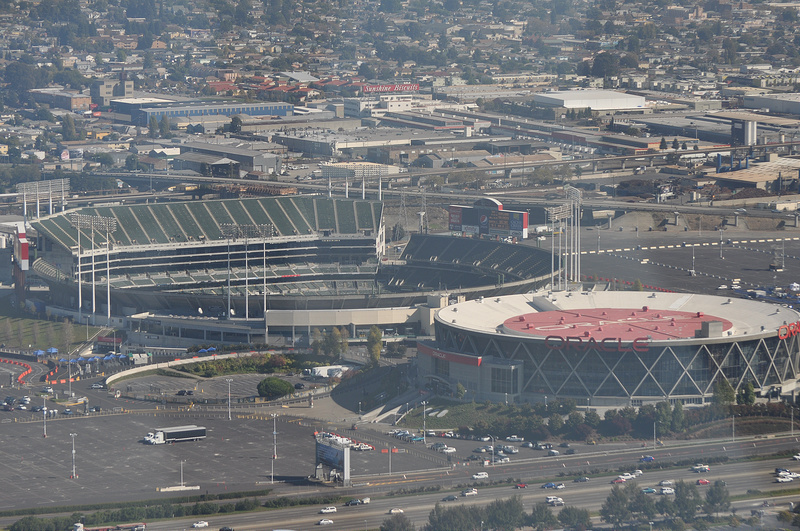 The Raiders will likely play at-least two seasons in Oakland before moving.